What’s happening in the world of outdoor gear and apparel this year? We travelled to the Outdoor Retailer Winter Market — an annual trade show in Salt Lake City, Utah, showcasing the newest and most innovative outdoors products — to find out. Granite Gear won a “Best in Show” award for their Nimbus Trace Access 70 — a Cordura-constructed, feature-rich multi-day backpack that’s also incredibly light for a 70-litre pack (1.9 kg). The five-way adjustable maple-core frame sheet — made from the same tech as downhill skis — ensures an ergonomic fit while still carrying 20 kg or more. Among the many other features, a zip-down access panel eliminates burdensome stuffing and re-stuffing. Vasque’s Eriksson GTX hiking boot combines quality leather with Gore-Tex for a traditional, European-inspired look in a fully waterproof boot. It also boasts an asymmetrical design for a natural gait. Light My Fire is most famous for their Firesteel 2.0 (profiled in our Summer 2013 issue), but they also sell the Grandpa’s FireGrill — a clampdown grill that attaches to a stick for roasting fish or veggies over an open flame. Filson, Seattle-based manufacturer of high-quality luggage, is — for the first time — showcasing a line of PVC dry bags. Jet black and available in backpacks, fanny packs and duffels, these look to be solid technical options for Filson fans. They’re also bringing out a line of camera bags — think customized foam compartments for DSLR equipment inside a classic Filson shoulder bag or backpack. Very “National Geographic.” Very cool. Patagonia’s big technical story is their new Nano Air jackets. These not-so-puffy mid-layers are four-way stretchy and feature a proprietary DWR-treated synthetic fill — which also stretches — to create what looks to be a great option for athletic activities like climbing or backcountry skiing. Patagonia says it’s the most breathable mid-layer they’ve ever made — 40 CFM breathability. Their R&D climbing team claims they can keep the jacket on all day; it breathes so well it never needs to be stripped off. Oboz is carving out a niche in the footwear category by appealing to the everyday outdoors-person. Rather than producing highly technical pro-level trail runners or mountaineering boots, Oboz builds for the weekend hiker — the casual, though active, outdoors enthusiast. 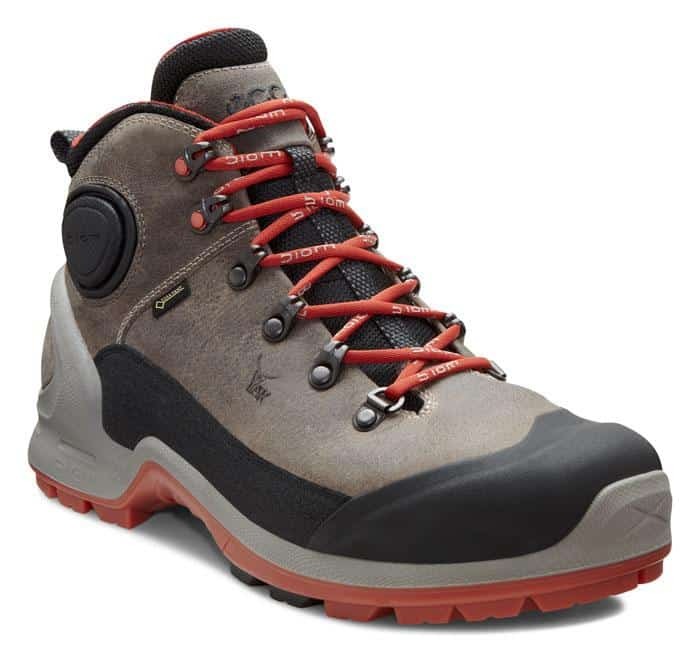 Their new mid-priced, waterproof Bridger hiking boot (men’s and women’s) looks to be well suited for this exact target. Tashi Sherpa founded his company, Sherpa, to honour his uncle — who was alongside Sir Edmund Hilary on that most famous of climbs. Making quality apparel in Kathmandu, and donating proceeds to help educate Nepalese children, Sherpa’s brand story is as compelling as their products — such as the new Vaya base layer (made with a Merino wool/Primaloft blend — they are the first to market with this) and limited edition Kritipur sweater jacket (only 1,000 will be hand-knitted). Click for DAY ONE & DAY TWO updates.